This exceptional bedside table is a fantastic addition to our ever expanding range of mirrored furniture. These bedside tables are very easy on the eye and would give any room a touch of neo-classical elegance. Lynx 77cm 3 Drawer Bedside Chest Complete. Bedroom Living Room Beds Dining Room Any Room. Black Gloss Finish All over. Colour Samples available. Choice of 8 Colour combinations. Modern Design & Style. 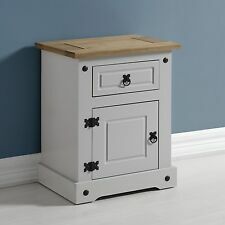 This 1 drawer bedside table is finished in off white with a natural wooden top. The bedside table has 1 drawer and a lower shelf, for extra storage. The set has a shabby chic/distressed finish and features detailing on the sides. This beautiful three drawer bedside table is part of the lovely Farmhouse Cottage Collection and is not only handmade but also carefully hand painted to give its distinctive shabby chic, distressed finish. Featuring three drawers, it boasts just enough storage as well as elegance to elevate any bedroom. Perfect to mix and match with any of our chest of drawers or dressing tables from this collection. They are very similar in style to the Librenza range by G Plan. These are a great pair of retro bedside cabinets dating from the 1950`s or 60`s. It is difficult to catalogue every mark so these will be generalised as light wear, heavy wear etc. Brown Wooden Bedside Cabinet Cupboard Drawers. Lynx 77cm 3 Drawer Bedside Chest Complete. Black Gloss & Walnut Finish. Colour Samples available. Choice of 8 Colour combinations. Modern Design & Style. Full Matching range available. Would work great as a bedside or lamp table. CREAM WOODEN CABINET. Cream distressed finish with blue and green hues on the side and back. 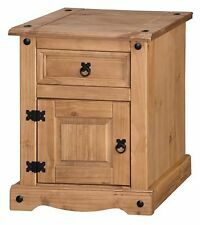 VidaXL Nightstand with 2 Drawers Brown. Made of durable, light weight MDF and high-quality pine wood, the easy-to clean cabinet is very durable for years of service. Garden & Patio. Material: MDF pine wood. Top sanded and stained with Walnut Finishing Oil for extra protection and better look. Slightly different units but can be treated as a matching pair. Beautiful piece of handmade furniture. Drawers are really deep and close perfectly as the cupboard does. Material: Pine. Room: Bedroom. Main Colour: Grey. The drawer and cupboard function well and the handles are new. The item has been thoroughly cleaned and the drawer loose lined with scented paper. SET OF 2 HAMPTON & STEWART BEDSIDE TABLE. Ideal as a bedside table, in the bathroom, hallway, living room etc for your storage needs. 3 drawer storage unit. Colour: White. No assembly required. Stylish and simple. Bedside Cabinet / Shabby Chic Bedside Table / Bedroom Furniture / Bedside / New. The Shabby Chic Bedside Cabinet adds a lovely French charm to your bedroom. The beautiful ornate design provides character and elegance. Corona Grey Bedside Cabinet. The Corona grey range covers dining, occasional and bedroom, giving you the opportunity to co-ordinate every room. MDF & Solid Pine (back of unit and drawer base is plywood). The superbly designed Birlea Lynx 3 Drawer High Gloss Bedside Cabinet is ideal for any bedroom. MORE ABOUT THE LYNX RANGE by BIRLEA FURNITURE. A superb quality range of high gloss bedroom furniture from Birlea Furniture. Beautifully designed with a two tone natural and grey washed effect, this solid pine bedside table would fit effortlessly into any traditional interior. The antique pine table top is finished with a clear wax coat for added protection whilst the light grey wax coat of the cabinet allows the natural warmness, grains and knots of the wood to shine through, putting emphasis on the high quality materials. Easy self assembly. Number of boxes: 1. Corona White Bedside Cabinet. The Corona white range covers dining, occasional and bedroom, giving you the opportunity to co-ordinate every room. MDF & Solid Pine (back of unit and drawer base is plywood). Condition is Used. not sure what type of wood. 18" Width 46cms. The Corona white washed finish with stunning solid pine tops is the most recent addition to our Corona furniture collections. The combination of South American pine combines effortlessly with the white finish. All products in our Corona collection are very generously proportioned, offer great storage opportunities whilst the White finish we use is practical and easy to maintain. Metal drop handles complete the look along with optional complimenting pin detailing. Constructed from solid pine and pine plywood, Corona, is part of our “painted furniture collection” which also features real dovetail drawers and raised and fielded panel doors, a true sign of craftsmanship. .
Modern White Gloss Wooden Small 3 Drawer Bedside Table /Cabinet Storage Unit. SET OF 2 HAMPTON & STEWART BEDSIDE TABLE. Ideal as a bedside table, in the bathroom, hallway, living room etc for your storage needs. Corona 3 drawer bedside features dovetailed drawers and a rustic wax effect lacquer finish and optional black studs. Solid Pine with strong plywood back and drawer base. The unit backs and drawer bases which are made from pine faced plywood that gives added strength and stability. A stunning mirrored bedside table from our elegant and chic York Collection. The bedside table has one storage drawer great for storing a hair brush, makeup or any other small accesories within. Would look elegant co-ordinated with another piece of furniture from our York Range. The top and the top section of "the drawers" lifts up revealing a commode. It is more a quirky piece of furniture and can be used for storage. This lovely unique commode cabinet masked as a chest of drawers has been hand painted in Annie Sloan's Paris Grey, waxed and slightly distressed - using our ageing technique we have enhanced the beautiful details and age of the piece, creating a wonderful unique charming piece of furniture. Distressed waxed pine top. Part of the new Corona range. Painted Grey finish. Getting the Right Products for You Each and every order you place is checked by one of our experienced sales team. We'll take a look at your order and make sure that the products you have chosen are suitably matched. Matching pair of bedsides left and right. Bedside Tables. It has lovely crystal effect knobs and a drawer where you could keep accessories or clothes along with a large storage cupboard. A lovely mirrored bedside table from our elegant and chic York range. Perfect for use in a bathroom or bedroom for toiletries or bedside necessities A natural polished wooden. 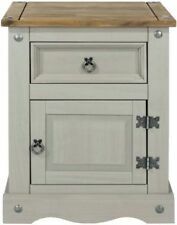 A collection of country style furniture shaded in a soft traditional chalk paint finish. Softly Polished Wooden Surface ideal to place a bowl of freshly cut garden flowers. The Kuba Lamp / Bedside Table - one of the pieces from the eye-catching and vibrant Kuba range. As each piece in the range is handmade, every item is truly individual. Part of our modern and remarkable Kuba furniture range. Can be mixed and matched with the rest of the Delhi range. This gives all the pieces of furniture a look of quality and beauty. Finally, there is also a White Glove service available. It must be unused and complete. 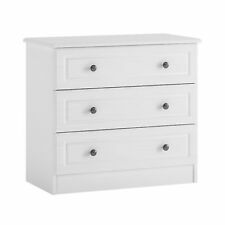 Hampshire Bedside Cabinet, 3 Drawers, Striking White Textured MDF and Melamine. 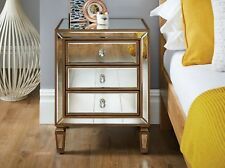 A very practical bedside unit, more like a miniature chest of drawers actually, this one is all about the storage. There's 3 drawers to keep all manner of things close at hand, and it would certainly do as an overflow when your other storage is filled to the brim. 5 out of 5 stars - Hampshire Bedside Cabinet, 3 Drawers, Striking White Textured MDF and Melamine. 6 product ratings6 product ratings - Hampshire Bedside Cabinet, 3 Drawers, Striking White Textured MDF and Melamine. The Corona white bedside table is the ideal storage solution. Cupboard: W43 x D35 x H31.5cm. Traditional bedside table. A modern take on traditional designs. Drawer: W28 x D32 x H9cm. Made from a wood combination of solid pine wood and MDF, this piece has a fresh white painted finish and waxed top to ensure its durability. LOVELY HAND-PAINTED MOROCCAN CABINET / BEDSIDE TABLE 68cm(h) WITH A DRAWER. Lovely Unique Moroccan BedSide Table, Wood, Handmade, hand-painted, in Red and Orange. With a drawer and a small cupboard. 530 x 380 x 660.